It’s time for the Grand Melee! In this high-stakes event, players compete with their strongest decks for a shot at one of the biggest reward pools in The Elder Scrolls: Legends – including the chance to earn up to 75 Houses of Morrowind packs and 2,000 Soul Gems! 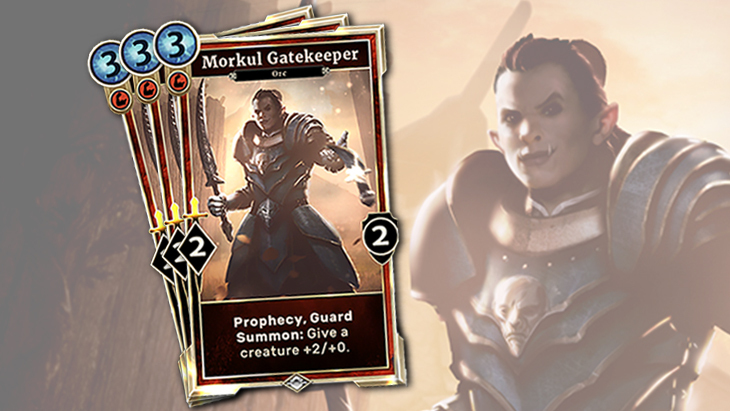 Additionally, all Grand Melee participants will receive a promotional playset of Morkul Gatekeeper – complete with premium animated alternative art – just for entering! How does the Grand Melee work? After selecting their deck, entrants face off until they complete 12 matches, with each victory sweetening their rewards. Players are only allowed one run during the event and can’t switch decks mid-Melee, so every moment counts! On top of rewards and promo cards, players who land a sweet spot on the leaderboards will also receive extra goodies based on their rankings, as seen below. In addition to winning five Premium Legendary cards, the top eight players from the Grand Melee will also have their decklists showcased in a future article! Entry into the Grand Melee begins Saturday, May 5, at 3:00 am EST and closes Sunday, May 6, at 3:00 am EST. Entry into the Grand Melee costs 1,000 Gold or 6 Event Tickets. Good luck!